By Sonia Tracy in Web Design. Updated on May 12, 2018 . Black and white are too of the most emotive visuals in nature. Polar opposites, the two seem to stand for opposing metaphors, as well. Black is usually seen as dark, a symbol of authority and power, and, occasionally, as a symbol of evil. White is a sign of purity and brightness and of a natural innocence that combats its opponent. The real benefit of these two shades is to meld together in a contrasting design. Using such a stark dichotomy, you immediately establish a dynamic in the design that is impossible for the viewer to ignore. It is clean, can be either simple or complex, and has endless opportunities that other color schemes just don’t manage to generate. It all just balances itself out. Many graphic designers today see that the best way to stick out in today’s full color world is not to join them but to set themselves apart by refusing to follow the norm. Duality has become the name of the game, giving us every reason to try it ourselves to see the effect. Let’s take a look at how black-and-white designs are being used in various graphics, with great success. 1300 on FillmoreThis specialty food product is a line created for the 1300 on Fillmore restaurant, run by chef David Lawrence. 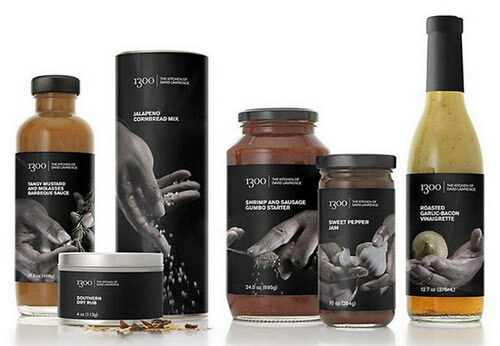 Each bottle design features a simple black-and-white picture of his hands as they work with various ingredients, each one related to the item itself. For example, you see Lawrence handling cornmeal for the jalapeno cornbread mix or dicing garlic cloves for the roasted garlic and bacon vinaigrette. The design is elegant and effective, without any color at all. It looks even more striking against the clear bottles of liquid dressings that have their own, natural color. 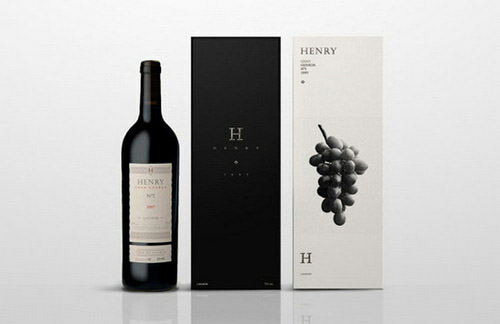 Henry (Lagarde)This Argentinian wine is already well known throughout Europe for its taste. But the packaging needed to be just as memorable. Using a black bottle instead of the traditional, shaded green glass, they used both a black-and-white label and a matching box. There are two different lines of the boxes, one that is black with white font and one that is white with black font, featuring a black-and-white picture of a cluster of grapes on a vine as the only decoration. The slight reddish color of the foil on the bottle works well with this design. Scent StoriesProbably the greatest example of black-and-white packaging, Scent Stories is a product line of perfumes made as a personal project by Ah&Oh Studio. It is based on four famous authors: Edgar Allan Poe, Marquise de Sade, George Orwell and Pierre de Laclos. Each scent was tailored to the tone of the writers’ stories, with a small explanation of each on the packaging. On the back of each bottle is a snippet from the authors’ most well known stories. Then, the bottles were topped with finely crafted busts for each. 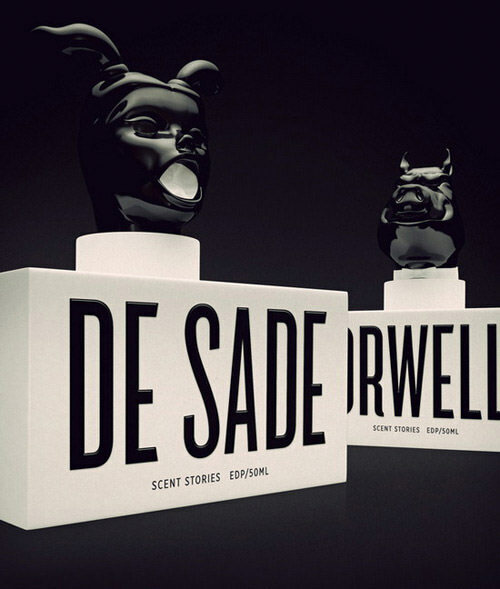 For de Sade it is a screaming women, for Poe a grinning skull, for Orwell a pig and for de Laclos a faceless, wigged aristocrat. Marcin Kaniewski PhotographyThis photographer has implemented a really brilliant design for his website. Not only does it use the beautiful contrast of black and white very effectively, going so far as to remove all color from even the thumbnails, but it acts as a portfolio as well. Each image features one of Kaniewski’s photographs, which can be viewed by clicking for a larger image. You can also change the background from black to gray or white. SubtractionSubtraction is the website for social collage app Mixel, created by former New York Times design editor Khoi Vinh. He took an interesting approach to the main image by using his large black dog as the featured subject. Then, he built the rest of the site in black and white around it. The unique factor here is not the design itself but the way Vinh manages to make the contrast appear friendly and warm rather than the usual intensity the dual shades create. 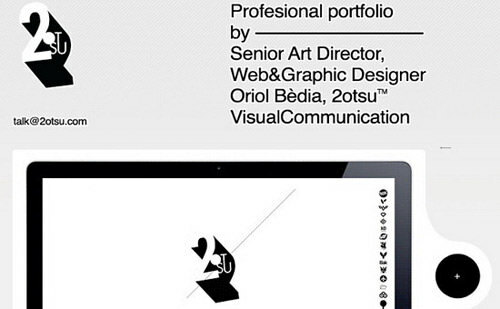 2otsuThis portfolio site for a graphic design group has been featured on a number of lists for best overall concept. Available in both Flash and HTML, it uses viewer interaction to great effect. You start by deciding what format you want to view it in. Everything at this point is black and white. Then, it takes you to the main page and has you select what color you want for the interface. From there, you are directed to the now customized list of fast, scrolling portfolio images, which are black and white until you click on them and they expand in full color. 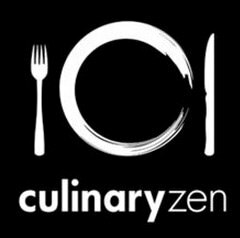 Culinary ZenThe black background with the white text and image is very direct and well made. It is impossible not to have your eyes immediately drawn to it as a whole rather than any particular part of the logo. The use of the "C" doubling as a plate is another nice touch that brings it all together by giving the image itself more relevance to the actual name, not just the focus of the company. Silent MonkeyUnlike the logo above, Silent Monkey uses a white background to give the image more light and brevity. The cartoon ape in the center is cute and simple, and the lack of a mouth brings the image together with the name very effectively. The text is extremely small, which is actually a benefit, as it makes the words seem somehow quieter, as though they are being whispered to the viewer. Fashion AustraliaNot all shades have to be so bold, and actually, using intermediate colors is a good idea for less stark logos. This one uses a dark gray that softens the image. 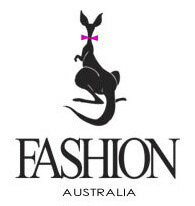 It works well with the only color in the logo, which is a pink bowtie on the kangaroo. It is also a softened version of a brighter shade, mixing it beautifully. Black and white are two of the most useful shades you can find for any design project. What are some of your own favorite examples of black-and-white design?